Juggling Frogs: "She's such a hypocrite, Mommy!" 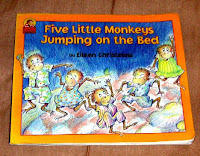 That's what Emily said, when she got to the end of this adorable "Five Little Monkeys Jumping on the Bed" book by Ellen Christelow. After succeeding in getting all her monkey kids (5 of them, just like in our family) to stop jumping on the bed (following the song), the mother monkey tucked them all in for the night. 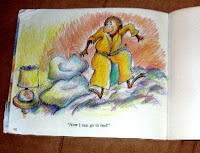 The monkey children are sleeping; the mother monkey says, "Now I can go to bed." The mother then starts jumping on her own bed. When Emily got to that part, she looked up, astonished, and said, "She's such a hypocrite, Mommy!" 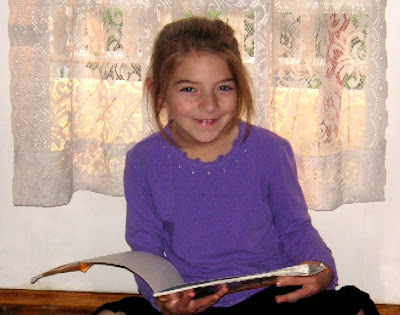 Giggling, she repeated, "She's such a hypocrite, right Mommy? She told them all they couldn't do it, and now SHE's doing it." Eyes twinkling, she said, "Mothers aren't supposed to do what they tell their kids not to do. That makes her a hypocrite, right Mommy?" Should I be proud that my seven year old uses this vocabulary? Perhaps. Somehow, pride is dwarfed by the fear caused by her discovery and identification of parental hypocrisy in the first grade! I'm in BIG trouble.....!! This is so cute! Yes, she is a hypocrite for sure. She should have never told her monkeys to stop jumping on the bed. You should jump on beds all the way into old age if you are able. Woo Hoo! !